In the past, Korea relatively did not have a lot of international comers or residents. However, from the late 1990’s, the Korean government began to actively drag foreigners to the nation, and as a result, the plan worked. This has brought an increase in international students as well. The number of international students in Korea has been steadily increasing in the past few years, and this tendency which has recently become popular seems to take a big part in Korean society. Companies, public institutions, and even the government are trying to attract international students, who clearly have strengths. International students are keep entering Korea to study, meanwhile companies and institutions also welcome these students, encouraging them to stay, and even to continue their future in Korea. According to numerous researches and surveys, the nation is actively looking for international talents, considering the advantages they have. First, it is thought that international students could be helpful in stimulating the domestic economy. Korea is also struggling with the reduction in the number of students in nation and the recruiting of more international students might work as an alternative. Lastly, the global market is a prerequisite for the future development, and gathering outstanding international students could work as fuel for further take-off. In the case of the United States, the research contributions made by international students from all over the world are enormous, especially in the field of natural science and engineering. Many businesses are trying to bring more international students into their workforces. 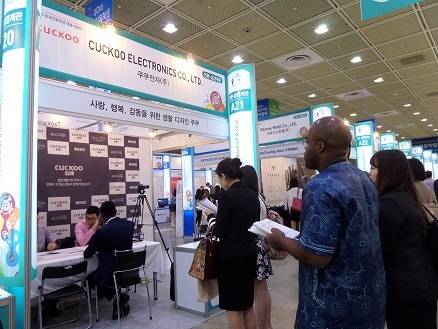 From September 10th to 11th, “Job Fair for International Students 2015” was held in Coex. This fair was started in 2011 on a very small scale, with only 38 businesses participating back then. However, in 2015, this fair marked its 5th with the number of 103 businesses, three times as many as 2011. The businesses that joined the fair include Amore Pacific, LG Electronics, Cuckoo, Ildong Pharmaceutical Co., and so on; all of them are the leading companies in each industry. The number of international students who visited the fair has also risen. About 2,400 students have registered for job counseling at the fair in the past two years. Employing international students is actively being held with businesses that are expanding global markets as the center. LG International and LG Electronics have recently created a separate recruitment for international students. Other corporations including Amore Pacific have also started to recruit international students in Korea. The government and public institutions are also making movements to attract international workers. From 2008, the Seoul government has been recruiting about 20 to 30 international students living in Seoul as interns every summer and winter vacation. The Incheon government is also selecting international student interns for ideas in the government’s global business. The Ministry of Education has lowered the admission condition in order to attract more international students, such as curtailing the criteria of TOPIK (Test of Proficiency in Korean) when entering universities in Korea from 3rd grade to 2nd grade. Furthermore, the department is planning to expand employment support for international students to actively attract more students and give a “friendly image towards KoreaThe Ministry of Justice has made it into law that international students studying natural science and engineering in Korea could enter Korean industries before graduation. “GKS (Global Korea Scholarship),” a scholarship for international students, which has a total of 60.5 billion Won to distribute, will also be expanded to one hundred billion Won in 2015, and 200 billion Won by 2020. The government has another big plan called, “Study Korea 2020,” launched in 2012, which plans to bring two hundred thousand international students to Korea. According to the Ministry of Education, the number of international students in Korea in 2003 was only 12,000. However, by 2014, it had increased to 84,891. The data from Higher Education in Korea tells that Korea University has the most international students studying in four-year-course-university, 3,336 in 2014. Kyung Hee Unviersity took second place with 3,144 students, while Yonsei Univerity had 3,093 international students in third place. Dongguk University took 7th place, with a total of 1,751 students. However, the number of students who entered universities in Korea to receive degrees was different. Kyung Hee University had the most undergraduate international students with 1,711, followed by Sungkyunkwan Univerity with 1,682 students, and Korea University with 1,172 students. Chinese students made up the biggest number overall among the international students with different nationalities, 59.3 percent, with Japanese making up 4.7 percent, and 3.7 percent for American and Vietnamese of the total number. The purposes for staying in Korea were various. The statistics until April 2015, as provided by Korea Immigration Service, illustrate that 65,287 out of 89,911 foreigners have come to Korea for study-abroad, 24,604 for Korean study, and 20 for other language study. The Korea Research Institute for Vocational Education & Training revealed the current situation of employment of international students in Korea; out of 382 international students who received Doctorates of Philosophy in Korea and got jobs, only 146 students are still working in Korea. This data implies that the number of international students, who remain in Korea for their careers, is small, compared to the support the government provides. Korea is looking for more and more international students because of their promising potentials. On the other hand, numerous concerns have also came out in connection to the policies by the government. KISTEP (Korea Institute of S&T Evaluation and Planning) has been collecting the data about the troubles between the company and international employees. One of the biggest concerns was that the international workers would have a narrow range of manpower. Most of the companies in Korea distribute business and manage performances through a lot of meetings, which could be an obstacle the international worker to fully understand the task, even if he or she is fluent in Korean, making them hard to instruct business tasks. Moreover, the atmosphere among the companies could make the international workers uncomfortable. Lack of respect in employee’s privacy, a sense of alienation from language problem, inflexible hierarchy, and excessive business hours compared to foreign companies could stress out international workers. The Korean government has fallen into a dilemma of whether to ease the standard or not. In 2011, the actual number of incoming number of international students has decreased for the first time. This was caused by the introduction of “International Education Quality Assurance System.” The system requires more documents to international students, which asks seven to eight more papers compared to that of the United States, Japan and several Europe countries. The government is struggling with this problem, because the number of illegal stay of international students has actually decreased. Moreover, an average of 63 international scholarship students invited and financially supported by the Korean government are giving up on studying in Korea, and return to their countries every year. 270 students out of 2,186 international scholarship students return without receiving degrees. The government is making efforts, such as lowering the standard of TOPIK grade, but has also received criticisms that such policy could lead to recruiting excellent manpower difficult. According to the survey made by Korean Educational Development Institute (KEDI), 55 percent of 1,000 international students replied that they have hard time understanding class contents, which tells that simply lowering the language standard cannot be the key to attract international talents, as seen with the result of response, which rather brought side effects. Companies and the government have seen the potential that international students have, leading them to accept more international talents. However, hasty plans have sometimes brought out concerns, criticisms, and questions asking if this is the best way. The government is actually pushing ahead with its plans, little by little fixing the problems. Study Korea 2020 has been called into question about its effectiveness and results, which has led the government to redefine the project with a new goal to be achieved by the year of 2023, not 2020. An official in a national university in Korea criticized the situation, explaining “The Ministry of Education is seeing international students only from an industrial view. What it should really think of is bringing them to Korea, educating them, and fostering them into excellent workers. I guess the government is only thinking of those students in a monetary view.” It is currently controversial among people whether the current policies are the best plans to have good students and expand the education scope. Nevertheless, one point is still very clear; international students are one of the most significant factors needed for globalized Korea. “Slow and steady wins the race.” Rather than focusing on numbers, the actual development of Korea needs to be considered first, the true goal. Maximizing the potential of international students in their education, and the career prospects they have could help Korea reach out globally and eventually put these students on the world stage. The current policy welcoming international students will then develop into a big strength in the future society.